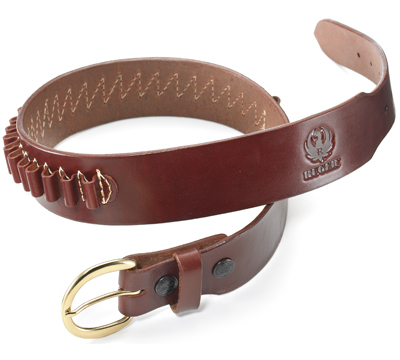 Heavy saddle leather belt has a walnut finish and is stamped with the Ruger logo. Belt includes cartridge loops for .44/.45 caliber. Belt is designed to match the Triple K holsters. Made in the USA by Triple K. Width-2" 50119 Med 33" - 38", 50120 Large 33" - 41", 50121 XLarge 43" - 48". It is recommended to order 2" larger than waist size. I found this belt to be very nice quality leather and comfortable to wear for a day of hunting or hiking. It fits well and matches the Ruger Super Redhawk holster also I have found many accessory holders to go with this belt making a nice combo at a great price.